Really good price as usually £29.99 on Groupon. Thanks to FTCom - The Ham comes with knife and board. Just tried to purchase in Swansea store and having already bought two and went back for a third, was told they had all been recalled by head office. The remaining were taken off sale. They were not aware at that point why , but said if it was a health issue then there would be a recall notice at the entrance shortly. Please be careful if planning to tuck into these straight away. Just picked one up from my local Morries. Looks good, 11 months before it goes off, as stated on front of box. Also worth mentioning it comes with stand and knife for cutting. Are these good never tried before? My mum had one from lidl it was very very hard to cut an they chucked it in the end so anyone got tips on best way to cut it? My mum had one from lidl it was very very hard to cut an they chucked it … My mum had one from lidl it was very very hard to cut an they chucked it in the end so anyone got tips on best way to cut it? Does anyone know how many kg it is? Wow thanks! Thats a brilliant size! i'll try and pick one up today. Of course it could be that 11 months on the front of the box is the maturing time, I've not really looked at the thing properly myself. My wife was all over it when she saw the advert this morning, so asked me to pop in to pick one up. Just as an aside, Aldi will be doing a small version of this and will have them instore in the early part of December from recollection, their about £13 and come with a small stand. Great for two people or if you've never had one before. Bought one today it is lovely 6.8kg and looks fantastic. 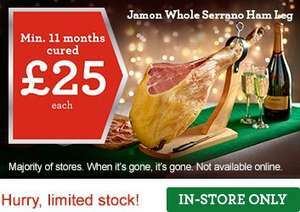 It seems Serrano Ham is coming to England! Just seen a bunch of them in ASDA, £30. Visca Catalunya! In my opinion 11 months curing is not enough. Viva España!! Of course it could be that 11 months on the front of the box is the … Of course it could be that 11 months on the front of the box is the maturing time, I've not really looked at the thing properly myself. My wife was all over it when she saw the advert this morning, so asked me to pop in to pick one up.Just as an aside, Aldi will be doing a small version of this and will have them instore in the early part of December from recollection, their about £13 and come with a small stand. Great for two people or if you've never had one before. At Aldi and Lidl these are around £50 so this is a bargain. Out of interest when you open it, how do you store it afterwards? Apparently Asda have been advertising this too, not sure of price though? I want to get this but a week before payday :(Apparently Asda have been … I want to get this but a week before payday :(Apparently Asda have been advertising this too, not sure of price though? Put the first cut slice (the fat) back on the exposed leg. Can also a bit of olive oil to seal and stop drying out. We covered with a tea towel when not using for a longer period. Had one from Aldi a couple of years back and nice, but need to slice very thin (practice!) to get the best out of it. The knife needs to be really sharp for this. The thing was huge and we were still eating it 6 months after Christmas! Gave up in the end, so interested to see the smaller, more manageable ones coming in this year...! Got one of these for my work sarnies this week. Hot (the deal, not the meat). Try £30. Seems to be the new standard price everywhere. I'm not sure why they're so cheap as I don't think they're much cheaper in Spanish supermarkets if at all. If I buy 4 could I rebuild a pig? Looks good for £25, especially if it's got the knife and board too. Makes a tasty sandwich and will last for ages. had a load in the Farnborough store last night, ton of preservatives in it! seems the quickest way to get bowel cancer! just bought 2 from Wokingham....plus the magnum of prosecco....nice work...thanks! Super heat, 11 months aged/ cured and weight 6 to 7 KG just the ham. Includes stand and knife wich cost around £30 on ebay. I had to build a stand myself as the Serano jamon I had bought at the end of august for £29 from Lidl didn't had one included(never buy one without the stand). They are around 100 portions( depends how you cut the portions its enough for a small wedding)on a 7 kg leg and each 100 grams of dried portion its made with 150 grams of fresh meat. I think it takes 6 months till goes bad could be 12 months (the box have a expire date) and depends the way you store it afterwards. You need to leave it as it is in the original box(have hols on sides of it for air to circulate) after you open it, cleaned it with olive oil when you want to eat again. The surface slices might need to go in the bin as they are a bit to dry to be chewed. Don't forget to give the bone to the family dog if you have one and its big enaugh, its gone make a nice treat as near to the bone its not so salty. Best of all at this moment regarding price/quant/qual at this moment as Asda is gone do one for £29 with stand but no knife( £10 to £20 as its a thin special knife for thin slices). Hence the fact that this is part of the black friday deal as advertise so the price could go up after. had a load in the Farnborough store last night, ton of preservatives in … had a load in the Farnborough store last night, ton of preservatives in it! seems the quickest way to get bowel cancer! Nearly every trolley had one in at our local this lunchtime. Go quick if you want the deal people, it is really cheap for what it is.